At Window World of Wichita, we think style and functionality go hand in hand. If you’re considering remodeling and want to use an option that incorporates both beauty and natural light into your living space, we suggest french or hinged patio doors. Both doors are made with a heavy mainframe that provides security from unwanted elements outside. Make the transition from inside to outside effortless, and beautiful, with these replacement door styles. One of the most elegant options for your home, French rail doors have large windows that make it easy to view your outside area. These doors have multiple lites, or pieces of glass that are cut and fit for the full length of the door. Decorated with the attractiveness of a French door, and offering the functionality of a space-saving sliding glass door, this option is the best of both worlds. Window World of Wichita stands behind our strong hinged patio doors. These doors not only offer exceptional functionality for your home’s entrance, but also add a beautiful element of design to your space. Features such as a 5” top rail and a 7” bottom rail are complemented by a curved handle, further accentuating the beauty of the door. Premium vinyl mainframe and sash extrusions are colored throughout. You won’t have to worry about chipping, peeling, cracking or warping. Mainframe and sash feature a double-wall design and multi-chambered construction for optimal thermal protection. 5″ top rail, 7″ bottom rail and 3″ side rails feature mortised joints to achieve traditional “French door” elegance. A reduction in energy costs is caused by 1” thick insulated glass that keeps you comfortable, no matter the season. Weatherstripping on both the internal and external sash ensures that your door is truly energy-efficient. Reinforced by steel at the interlocks and lock rails increase strength and the structural integrity. Hinge doors have superior sealing due to the closed-cell foam gaskets on the Mainframe joints. Window World of Wichita offers vibrant hues to dress your handle up or down. 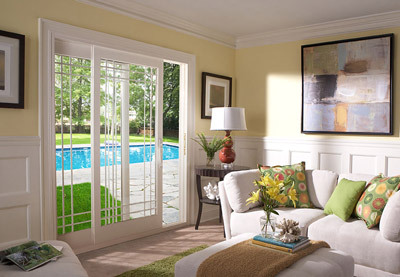 Have questions about French rail or hinged patio doors? Your local Window World professionals are standing by, ready to help.